He was the builder of the Great Pyramid of Giza, erroneously attributed to Cheops. In it he incorporated his knowledge of the ancient wisdom and also securely secreted records and instruments of ancient Atlantis. For some 16,000 years, he ruled the ancient race of Egypt, from approximately 52,000 B.C. to 36,000 B.C. At that time, the ancient barbarous race among which he and his followers had settled had been raised to a high degree of civilization. 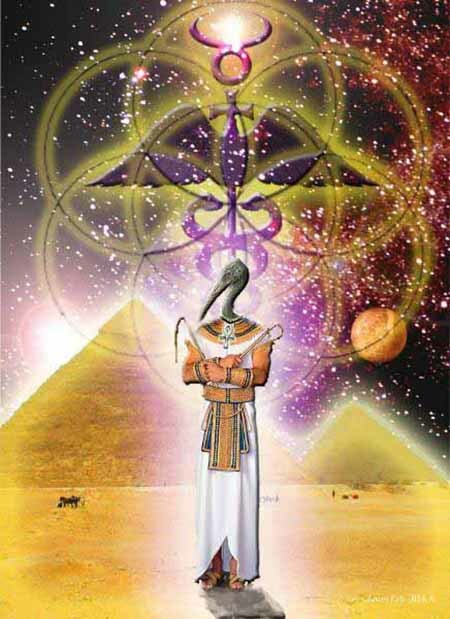 In later times, the descendants of these guards became the pyramid priests, by which Thoth was deified as the God of Wisdom, The Recorder, by those in the age of darkness which followed his passing. In legend, the Halls of Amenti became the underworld, the Halls of the gods, where the soul passed after death for judgment. During later ages, the ego of Thoth passed into the bodies of men in the manner described in the tablets. As such, he incarnated three times, in his last being known as Hermes, the thrice-born. In this incarnation, he left the writings known to modern occultists as the Emerald Tablets, a later and far lesser exposition of the ancient mysteries. The tablets translated in this work are ten which were left in the Great Pyramid in the custody of the pyramid priests. The ten are divided into thirteen parts for the sake of convenience. The last two are so great and far-reaching in their import that at present it is forbidden to release them to the world at large. However, in those contained herein are secrets which will prove of inestimable value to the serious student. They should be read, not once, but a hundred times for only thus can the true meaning be revealed. A casual reading will give glimpses of beauty, but more intensive study will open avenues of wisdom to the seeker. Some thirteen hundred years B.C., Egypt, the ancient Khem, was in turmoil and many delegations of priests were sent to other parts of the world. Among these were some of the pyramid priests who carried with them the Emerald Tablets as a talisman by which they could exercise authority over the less advanced priest-craft of races descended from other Atlantean colonies. The tablets were understood from legend to give the bearer authority from Thoth. The particular group of priests bearing the tablets emigrated to South America where they found a flourishing race, the Mayas who remembered much of the ancient wisdom. Among these, the priests settled and remained. In the tenth century, the Mayas had thoroughly settled the Yucatan, and the tablets were placed beneath the altar of one of the great temples of the Sun God. After the conquest of the Mayas by the Spaniards, the cities were abandoned and the treasures of the temples forgotten. It should be understood that the Great Pyramid of Egypt has been and still is a temple of initiation into the mysteries. Jesus, Solomon, Apollonius and others were initiated there. The writer (who has a connection with the Great White Lodge which also works through the pyramid priesthood) was instructed to recover and return to the Great Pyramid the ancient tablets. This, after adventures which need not be detailed here, was accomplished. Before returning them, he was given permission to translate and retain a copy of the wisdom engraved on the tablets. This was done in 1925 and only now has permission been given for part to be published. It is expected that many will scoff. Yet the true student will read between the lines and gain wisdom. If the light is in you, the light which is engraved in these tablets will respond. Now, a word as to the material aspect of the tablets. They consist of twelve tablets of emerald green, formed from a substance created through alchemical transmutation. They are imperishable, resistant to all elements and substances. In effect, the atomic and cellular structure is fixed, no change ever taking place. In this respect, they violate the material law of ionization. Upon them are engraved characters in the ancient Atlantean language: characters which respond to attuned thought waves, releasing the associated mental vibration in the mind of the reader. The tablets are fastened together with hoops of golden-colored alloy suspended from a rod of the same material. So much for the material appearance. The wisdom contained therein is the foundation of the ancient mysteries. And for the one who reads with open eyes and mind, his wisdom shall be increased a hundred-fold. Man's search for understanding of the laws which regulate his life has been unending, yet always just beyond the veil which shields the higher planes from material man's vision the truth has existed, ready to be assimilated by those who enlarge their vision by turning inward, not outward, in their search. In the silence of material senses lies the key to the unveiling of wisdom. He who talks does not know; he who knows does not talk. The highest knowledge is unutterable, for it exists as an entity in lanes which transcend all material words or symbols. All symbols are but keys to doors leading to truths, and many times the door is not opened because the key seems so great that the things which are beyond it are not visible. If we can understand that all keys, all material symbols are manifestations, are but extensions of a great law and truth, we will begin to develop the vision which will enable us to penetrate beyond the veil. One of the greatest of all Cosmic Laws is that which is responsible for the formation of man as a material being. The great aim of the mystery schools of all ages has been to reveal the workings of the Law which connect man the material and man the spiritual. The connecting link between the material man and the spiritual man is the intellectual man, for the mind partakes of both the material and immaterial qualities. The aspirant for higher knowledge must develop the intellectual side of his nature and so strengthen his will that is able to concentrate all powers of his being on and in the plane he desires. In the following pages, I will give an interpretation of the Emerald Tablets and their secret, hidden and esoteric meanings. Concealed in the words of Thoth are many meanings that do not appear on the surface. Light of knowledge brought to bear upon the Tablets will open many new fields for thought. "Read and be wise" but only if the light of your own consciousness awakens the deep-seated understanding which is an inherent quality of the soul.